Alexandre Benois was an artist in the full sense of the word. He lived, breathed, wrote, created, and celebrated art, both on and off of the ballet stage. As an artist, Benois was not as prolific as a painter for the sake of painting or creating, but rather as a method of ballet set and stage design. 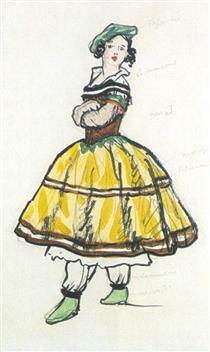 He began his career at the Mariinsky Theatre as a scenic designer, and quickly expanded his role to be at the forefront of ballet set and costume design. 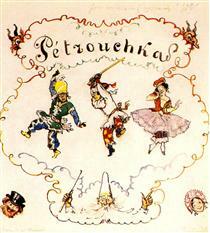 His most famous production was Petrushka, in 1911, a production in which he also co-wrote the libretto with composer Igor Stravinsky. To escape the violence of the Russian Revolution of 1917, Benois devoted his time to the study of art in periods of Russian history. He also became a specialist on ancien-regime French art. In his writings, he stressed individualism and artistic personality, and wanted to combine Western European trends in art with Russian Folk art. 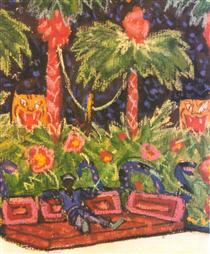 Many of his paintings are illustrations of scenic decorations and set designs for ballets, and as such are not as technically accurate as they are emotionally charged and colorful. Many of his works evince a dreamlike quality, in which the viewer can mentally envision setting foot on stage. Benois produced over 100 writings on topics ranging from art history to his Memoirs, and worked on over 200 ballet productions world wide. He is now considered one of the creators of modern ballet. Alexandre was born into the artistic and intellectual Benois family, prominent members of the 19th- and early 20th-century Russian intelligentsia. His mother Camilla (ru: Камилла Альбертовна Кавос, and then Бенуа) was the granddaughter of Catterino Cavos. His father was Nicholas Benois, a noted Russian architect. 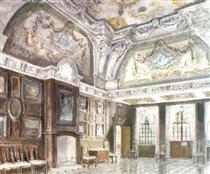 His brothers included Albert, a painter, and Leon, also a notable architect. 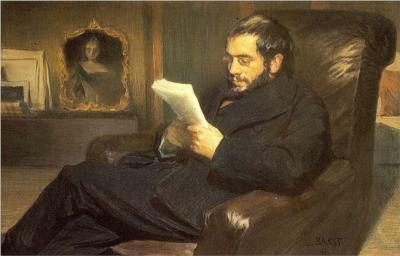 His sister, Maria, married the composer and conductor Nikolai Tcherepnin (with whom Alexandre would work). Not planning a career in the arts, Alexandre graduated from the Faculty of Law, Saint Petersburg Imperial University, in 1894. 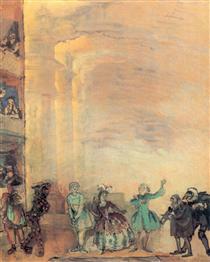 Three years later while in Versailles, Benois painted a series of watercolors depicting Last Promenades of Louis XIV. 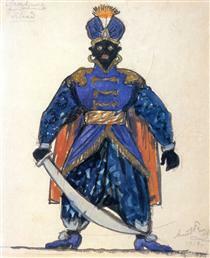 When exhibited by Pavel Tretyakov in 1897, they brought him to attention of Sergei Diaghilev and the artist Léon Bakst. Together the three men founded the art magazine and movement Mir iskusstva (World of Art), which promoted the Aesthetic Movement and Art Nouveau in Russia. During the first decade of the new century, Benois continued to edit Mir iskusstva, but also pursued his scholarly and artistic interests. 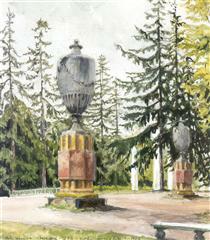 He wrote and published several monographs on 19th-century Russian art and Tsarskoye Selo. 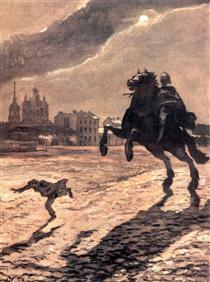 In 1903, Benois printed his illustrations to Pushkin's poem The Bronze Horseman, a work since recognized as one of the landmarks in the genre. In 1904, he published his “Alphabet in Pictures,” at once a children’s primer an elaborate art book, copies of which fetch as much as $10,000US at auction. Illustrations from this volume were featured at a video presentation during the opening ceremony of the Winter Olympics in Sochi in 2014. 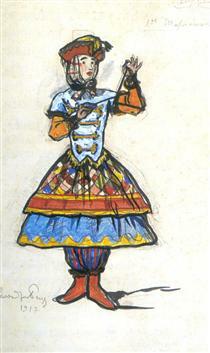 In 1901, Benois was appointed scenic director of the Mariinsky Theatre in Saint Petersburg, the performance space for the Imperial Russian Ballet. He moved to Paris in 1905 and thereafter devoted most of his time to stage design and decor. 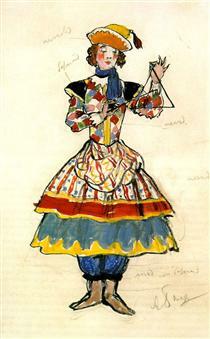 During these years, his work with Diaghilev's Ballets Russes was groundbreaking. 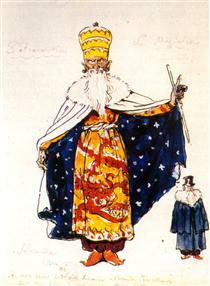 His sets and costumes for the productions of Les Sylphides (1909), Giselle (1910), and Petrushka (1911), are counted among his greatest triumphs. 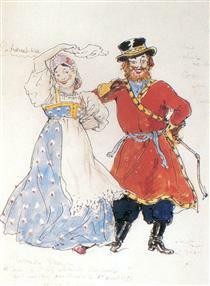 Although Benois worked primarily with the Ballets Russes, he also collaborated with the Moscow Art Theatre and other notable theatres of Europe. 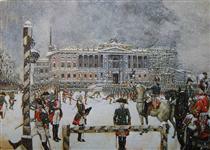 Surviving the upheaval of the Russian Revolution of 1917, Benois achieved recognition for his scholarship; he was selected as curator of the gallery of Old Masters in the Hermitage Museum at Leningrad, where he served from 1918 to 1926. During this time he secured his brother's heirloom Leonardo da Vinci painting of the Madonna for the museum. It became known as the Madonna Benois. 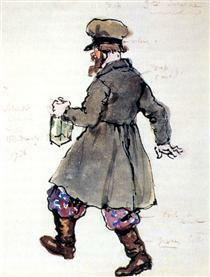 Benois published his Memoirs in two volumes in 1955. In 1927 he left Russia and settled in Paris. 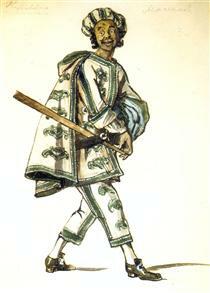 He worked primarily as a set designer after settling in France.